Pruning helps develop good structure in growing trees and shrubs. Pruning also allows for maintaining space between buildings, streets, other plants, utility lines etc. and removes hazardous dead or broken limbs. When Pruning Trees we remove crossing, co-dominant, dead, diseased, and dying limbs that can aid in the spread of diseases and become safety hazards. Pruning can be a source of stress on mature trees and shrubs when improperly done. Our Arborists make all of our cuts according to the ANSI A300 standard. Also with our belief that every leaf has its purpose, you can be assured that our pruning is done to provide necessary clearances while maintaining and improving the natural structure of your trees and shrubs. Request your free quote now! Learn more about our pruning guide! We are lovers of trees, but when trees develop problems such as decay and other structural issues removal must be considered. Russell Tree Experts has the tools, equipment and experienced man power to perform everything from removing a few unwanted shrubs to the largest, most technical tree removal. We are trusted by everyone from individual home owners to city managers to perform the highly skilled trade of hazard tree removal. Request your free quote now! DIRECT FELLING - When site conditions do not need maximum protection, direct felling is a safe and economical method for tree removal. RIGGING - To protect structures, landscapes, and personal property our crew will set up a custom rigging system to maintain total control of each piece of the tree being removed. MECHANICAL - When conditions allow and property needs protected on the site, mechanically assisted tree removal is a safe and efficient way to remove trees with little to no impact on the surrounding area. Also, learn more about TREE FOR A TREE™ - Our program dedicated to planting a tree for every tree we remove! Many urban trees suffer from structural problems, such as co-dominant stems, which result in weak branch unions and limb failure. Bracing and cabling systems can attempt to offer some added support during extreme weather such as wind and ice. Request your free quote now! STATIC CABLING - Static cabling systems are mainly used to help provide supplemental support to tree parts in times of high load, such as storms. Some tree structures are more prone to failure than others. A tight “V” at the base of two stems is one such structure type. More than one cable is often needed to properly support the weight of the limbs. DYNAMIC CABLING - Dynamic cable systems allow trees to continue natural stretch and movement in the weather. Once the limbs that have been cabled for attempted support move more than about 1-2 feet apart, the Dynamic Cable provides a link between the 2 stems so that they begin to balance their weight against each other. 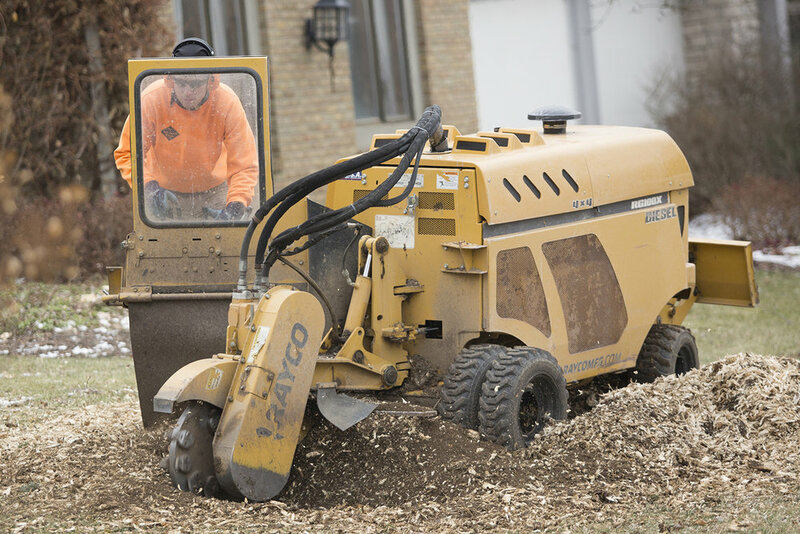 Our Stump Grinding Crew follows our Production Crews a few days after your tree removal to grind down the remaining stump(s). Stumps yield debris - often a small to medium sized mound of organic material which can serve as an excellent source of mulch. Keep the grindings for yourself or share with a neighbor. If you’d like, we do offer a follow-up stump hauling service for the debris (at an additional fee). See below for our stump grinding options. Request your free quote now! NO GRINDING - Stump will be cut parallel with the ground within 6-8” from grade. BELOW GRADE - Stump will be ground out to about 6-8” below surface of soil. This is usually sufficient for growing grass if desired. Shavings are left on site. DEEP & WIDE - Stump will be ground out deep and wide enough to be able to dig a hole in the same spot to plant a new tree without hitting major roots. Shavings are left on site. STUMP RESTORATION - Stump will be ground out to about 6-8” below surface of soil. The shavings are removed and fresh topsoil is placed on top. All you’ll need to do is sprinkle grass seed (and water) and it’ll be like the stump was never there! Click here to learn more about Stump Restorations! Our tree lighting protection systems are designed to provide a point for lightning’s current to travel safely to ground. The installation of our lightning protection systems will reduce the likelihood of damage to the tree and nearby structures (that would have been damaged by falling limbs or the entire tree!). Our expertly installed systems are very effective at preventing lightning damage to trees! Request your free quote now! Our forestry mower can efficiently clear areas of trees and brush, leaving material in a shredded/mulched state, evenly spread over the site. We have reclaimed landscapes for cities, businesses, and private residences in this way. Great for reclaiming areas that have been filled with invasive species such as Honeysuckle, Autumn Olive, and multiflora Rose. We also work with building contractors to use our tree crews and forestry mower for lot clearing prior to home construction. Request your free quote now! From managing the Urban Forest of your campus to curbside brush collection, we can offer competitive ‘not to exceed price’ bids, fixed time and equipment rates or any combination of both for our arborists to help on all types of tree related work. The safety of you, the public and our employees is our top priority. Every member of our team goes through our extensive, on going, documented training system to ensure each employee is proficient in the skills required to do their job. At Russell Tree Experts we know the importance of bringing a tree job in at or under budget. We take pride in our ability to efficiently manage our labor and equipment resources to complete your job in the safest, most cost effective way. Request your free quote now! We understand your business needs are different from routine tree work. We can accommodate your businesses schedule with flexible crew hours that wont interfere with your operations. Request your free quote now!